9 juni 2011 - Internet data traffic has grown by a factor of 15,000 in the last 15 years. But in all that time there has been no significant update of the internet itself; data packets are still transported in the same, hardly intelligent way, according to prof. Antonio Liotta. But that needs to change quickly, he says, because the growth of internet will be even greater in the near future because of trends like the emergence of HD video, ‘cloud computing’ and the ‘Internet of Things’. Liotta believes the solution lies in intelligent, learning networks, inspired partly by nature: ants, bees and the human brain. The number of internet users has increased in the last 15 years from 36 million to 2 billion. You might think that with a world population of 7 billion, the end of that spectacular growth should be in sight. But that would be wrong. Because the huge horde of future new internet users consists not of people, but of things. Products and systems will increasingly be connected in the future. And today’s PCs and smartphones will soon be followed online by cars, refrigerators, thermostats, medical sensors, safety and security systems and even toys, to name just a few examples. That will change the internet into what is already being referred to as the ‘Internet of Things’ (uniquely identifiable objects). The numbers of connected devices will quickly reach billions, leading to new data streams of phenomenal size. These will be on top of all the extra data traffic caused by the increasing use of streaming video of ever-higher quality, and because the numbers of online users are still continuing to increase. Then there’s also the trend towards ‘cloud computing’: people and companies are no longer buying extensive hardware and software themselves, but are using third-party systems to which they are connected by internet. Just one example of this is all the tools offered by Google. As a result, data traffic that formerly stayed within the walls of the home or office is increasingly being transported over the internet. But up to now we’ve only been talking about the growth factors that we already know, warns Liotta; who knows what new applications may still emerge, bringing with them even more data traffic. Just as a reminder: seven years ago YouTube didn’t even exist, to name just one example. Liotta is clear: today’s network protocols that control data traffic belong literally and figuratively to the last century, and the point will soon be reached when they can no longer handle the growth in data traffic. The internet is now much more complex than the human brain, says Liotta, but the protocol that it uses is much simpler. For example all the data packets on the internet are handled in the same way. Streaming video has exactly the same priority as e-mail. And while it doesn’t matter much if an e-mail takes a minute to reach its destination, a gap of less than a second in a video stream is enough to cause irritation. Worse still, spam – which accounts for 80% of global e-mail traffic – has exactly the same priority. An extra problem is that data transport is far from perfect: at present 1 in 10 data packets never reach their destinations, and have to be resent. So things have to change, but how? Liotta believes the solution lies in ‘cognitive networks’; intelligent, learning networks. One of the things from which he takes his inspiration is the knowledge about biological and neural networks, which are the results of millions of years of evolution. For example, a common factor among ‘naturally’ evolved networks like these is the use of short pathways, so data never needs to pass through more than a handful of nodes to reach its destination. And that means efficient transport and routing. Liotta can draw on different knowledge domains to create better network protocols. Self-regulating or ‘autonomic’ networks is one of them. A good example is the human autonomic nervous system, which controls the unconscious physiological functions without the need for any conscious intervention. Another source is ‘machine learning’, in which systems are programmed in such a way that they learn to perform their tasks better through trial and error. Another area in which solutions can be found is ‘bio-inspired networks’. How does nature organize networks? One example is the way in which bees and ants are able to navigate. And the way in which fireflies all light up at the same time. These too are examples of network structures. The new professor is far from being the only person to address these issues in his research. If we could re-invent the internet today, and we were able to replace it immediately, how would its successor look? For Liotta, this is ‘The billion dollar question’. The European Commission alone has allocated half a billion euro to answering that question in its Seventh Framework Programme. Prof.dr. Antonio Liotta (1968) will hold his inaugural lecture entitled ‘Cognitive Interconnections’ in the Blauwe Zaal of the Auditorium of Eindhoven University of Technology from 16.00 hours on 10 June. The lecture will be preceded by an international symposium on this subject, entitled ‘Autonomic Networks at the Heart of the Future Internet’. Liotta is professor of Communication Network Protocols in the departments of Electrical Engineering and Mathematics & Computer Science. 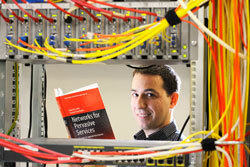 His book ‘Networks for Pervasive Services’ is available from this week: http://bit.ly/pervasive-networks.